Archive for the ‘IPAWS-OPEN’ Category. What Gates are Involved in Developing Applications that use IPAWS? If I was a public safety or transit organization and wanted to connect to the IPAWS-OPEN for Alert origination and/or dissemination, what administrative (legal, financial, etc.) and technical (information assurance, qualification, etc.) gates would I have to pass? a. First, we have a lab at Indian Head, MD with several alert and warning tools that work with IPAWS. We use this lab to understand the state of the industry for alert and warning. We would welcome you to bring your capability to this lab. Further Questions? I can help you get started. I will be explaining the contents of the new IPAWS-OPEN Developer’s Guide tomorrow. It will soon be added to downloads from the FEMA IPAWS-OPEN web site. IPAWS-OPEN enables the interoperable sharing of emergency alerts and incident-related data between systems that comply with non-proprietary information standards, and serves as the alert aggregator for the Integrated Public Alert and Warning System. During our next Webinar, System Architect Gary Ham will provide an introduction and overview of the new IPAWS-OPEN Developer’s Guide. The purpose of the guide is to help developers successfully write IPAWS-OPEN interoperable code. This program is intended primarily for third party IPAWS-OPEN developers and testers. Please make plans to join us via Live Meeting. As always, your questions and comments are welcome. If you are unable to attend this month’s program due to other commitments, a recording will be accessible from the FEMA Library. IS-247 provides basic information on the Integrated Public Alert and Warning System (IPAWS). The goal of this course is to provide public safety officials with: increased awareness of the benefits of using IPAWS for effective public warnings; skills to draft more appropriate, effective, and accessible warning messages; and best practices in the effective use of Common Alerting Protocol (CAP) to reach all members of their communities. The course is expected to take 2 hours to complete and includes a final exam. Regional, State and Local alerting authorities must successfully complete this course prior to being authorized to use IPAWS OPEN to send alerts via EAS, mobile devices, and other communications pathways. Although the course is designed primarily for emergency management, law enforcement, fire services, dispatch, and other public safety personnel, anyone wishing to learn more about IPAWS may take the course. If you work with the National Information Exchange Model (NIEM) as well as with other standards, you often run into issues related to how your overall work should incorporate (or not incorporate) NIEM. The rules for NIEM allow you to use recognized external standards independently. FEMA’s Integrated Public Alert and Warning System (IPAWS) does this with it implementation of the Common Alerting Protocol (CAP). You can also use components from an external Standard within a NIEM conforming schema, but only if you use the formally defined NIEM “Adapter” approach. You can also use NIEM inside an externally defined standard wrapper as shown in the graphic below. My talk at the NIEM National Training Event (NTE) in Philadelphia this August will discuss using an OASIS Emergency Data Exchange Language – Distribution Element (EDXL-DE) as a wrapper as shown, but it will go beyond that. 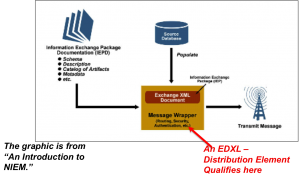 It will show how NIEM conforming data structures can be used within the EDXL-DE wrapper itself as DE conforming metadata to describe the content and desired distribution of the Information Exchange Package (IEP). The goal is to show an innovative use of NIEM that is actually made possible by the (also) innovative structure designed into the EDXL-DE standard. The actual content of the IEP will be an IPAW Profile conforming CAP message. The wrapping DE will use NIEM conforming metadata to define IPAWS distribution and content identification needs.